Haven’t you always wanted to know what happens when you put nearly 200 strategists and content experts together in one hotel? Well now you will; our Strategy team attended the Confab Intensive at the Westin Hotel in Seattle, Washington. Vajaah and Lisette spent three days from September 19-21 at Confab. As opposed to Confab Central’s conference, Confab Intensive provided our strategists with two deeper, hands-on workshops each day. 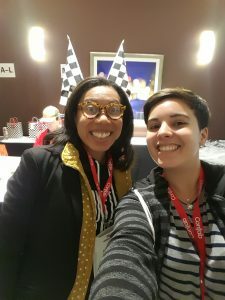 Vajaah and Lisette attended workshops on everything from content modeling to video content best practices. Needless to say, our Strategy team brought back a number of insights on content strategy to share with WDG and WDG’s audience. Do not be terrified to share work in progress. In context this workshop tackled the matter of sustainable content development. Detail oriented explorations into sample content types surfaced the inherent challenges of creating systems and providing guidelines for content to be maintained across teams. 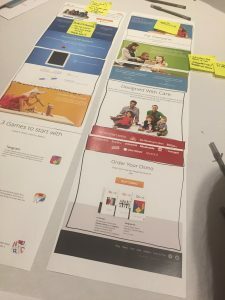 Instead of visualizing the front-end, end user experience, this workshop forced teams to think about the content management system as a series of wireframes that needed to structure a consistent approach to content entry and ultimately display. Vajaah’s team worked to design a content system interface for food frying machine sales. Perhaps the most promising challenge to tackle was the matter of integrating editorial guidelines and CMS instructions within the system. After the hard work to create a flexible and fitted system is done, the system needs to be leveraged as teams and roles change throughout an organization. Documentation saved into a PDF that never changes is not a good solution. Leaving each build with the inherent obstacle of integrating and version controlling system help, tutorials and instructions. This session reviewed some common design sketching exercises like 6-ups to 1-ups and mind mapping approaches. Perhaps the most unexpected advice, was the amount of conversation and insights to be gained from printing out a website and physically annotating it. As a norm, many of the strategy sessions conducted by WDG’s team have analog components but we’ve always maintained that websites are intended to be viewed in a browser, not on paper. Scott and Michael were able to push past that irony and the exercises were constructive and minimized distractions. We’ll definitely conduct S.W.O.T. (strengths, weaknesses, opportunities and threats) exercises around printed websites going forward. By removing links, scrolling and device sizes, participants can focus on content and how a single page tells an entire story. Ultimately, content strategy can be visually communicated and it should be. The mountain of research alone will not, “comfort the stakeholders, direct the attention, engage the audience and show the scope of work,” on its own. Everyone was encouraged to use whatever works from sketches to systems created for other purposes in order to communicate process and conclusions. One of the main points of this workshop was to resist “satisficing”– accepting what is “good enough” instead of exploring deeper insights. One of the main problems with interviewing stakeholders or audiences is that often we assume the answer or we pull people out of their context. Instead, make it a point to empty out your preconceptions before the interview and study people in their own context. Go to the place where people are doing the activity you are marketing towards. Check your worldview at the door – do a team-wide braindump, ask yourselves “what do we think we will hear?”. Make the interview about the interview. Embrace how other people see the world. Most importantly, build rapport and sincerely listen to the person you are interviewing. Ask questions you think you know the answer to. This workshop ended with a round of interviews among participants on broad issues such as news, food, and music. It was surprising to see how coming into an interview with an open mind can spark new ideas. After noticing a need for a service to identify ingredients in someone’s pantry and take into consideration limited time to cook, Lisette’s table ended with an outline of a innovative food prep app! “You guys picked the hardest workshop in the conference,” Tracy Playle said at the beginning of the session. And she wasn’t joking. Mastering comedy is a difficult task. While there are certain formulas and theories behind the science of getting a laugh, many organizations are afraid of the worst outcomes of misplaced and mis-executed comedy. This session focused on educating participants on the different theories of comedy, and then how to use this knowledge in planning a comedic approach to content. The strategy is deceptively simple: pick a type of comedy (deadpan/slapstick), add a tactic (situational/topical/surprise), and then provide the content medium (video/poster/audio). The exercise in the workshop was also deceptively simple–a group of participants were given an organization and industry. We then had to figure out how to use comedy in the organization’s content marketing. The result? Our strategist’s group made an on-the-fly graphic. The alternative tagline was “We’ll help you plan your last resort”. 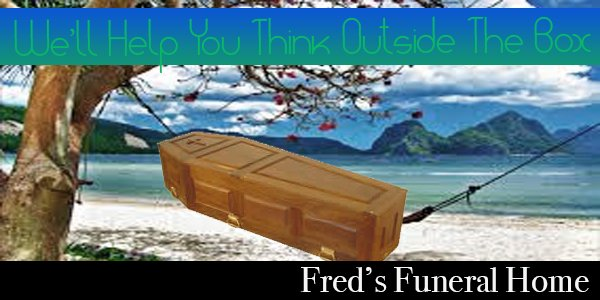 Morbidity aside, we also planned a more tone-downed way for a serious company like a funeral home to explore comedic opportunities. An open class titled “10 Things You Always Wanted to Know About Death But Were Afraid To Ask” would be an educational service to the community as well as a unique way to infuse humor into the organization’s brand. Our team was impressed with the breadth of expertise presented at Confab Intensive. We plan to use these insights going forward with our clients and internally. We believe that people should #alwaysbelearning. There is nothing more satisfying than opening up new opportunities and expanding our horizons. Interested in working with a digital team whose expertise is continuously honed and broadened? Want to learn how these lessons can be applied to your organization? Drop us a line. Contact us.